KutiMangoes er 6 manna afro-soul hljómsveit sem kemur hingað frá Kaupmannahöfn ásamt söngvaranum Patrick Kabré frá Burkina Faso. Síðasta afurð sveitarinnar “Afro-Fire” hlaut dönsku tónlistarverðlaunin árið 2014 í flokki heimstónlistar og einróma lof gagnrýnenda. Yfir vötnum svífur andi Fela Kuti með tilvísunum í útsetningar og tónlist Charles Mingus og Ornette Coleman. Áhugaverð blanda þar! Á sviðinu standa 3 blásarar, tveir trommuleikarar, pianóleikari og söngvarinn ótrúlegi. 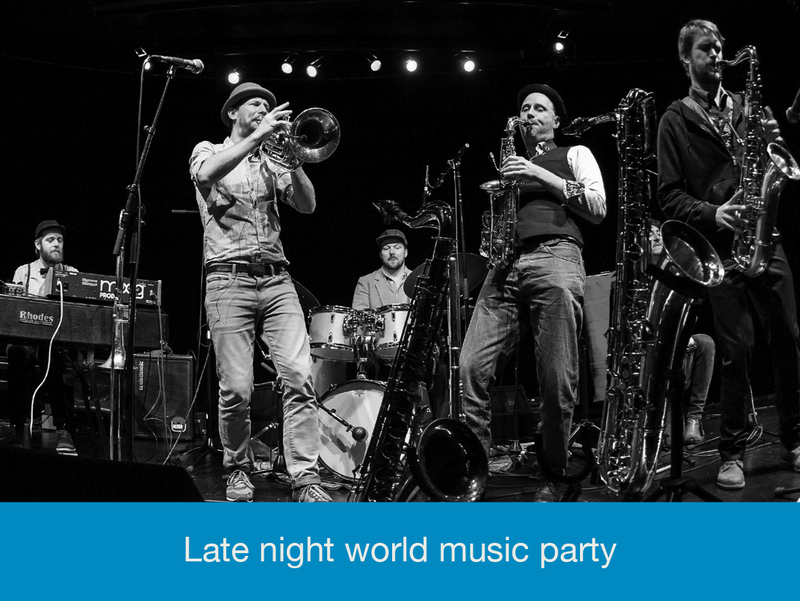 Based in Copenhagen, the 6-piece afro-beat/soul band has teamed up with fantastic vocalist Patrick Kabré from Burkina Faso for live touring as well as their debut album “Afro-Fire” – released in 2014 on the renowned German funk/afro-beat label Tramp Records. The album has won the Danish Grammy for Best World Music Album 2014 as well as receiving critical acclaim. The KutiMangoes don’t focus on being highly authentic, but on combining the soul of Fela Kuti and the delusional arrangements from Charles Mingus. Three brass players, two drummers and a man at the keys skillfully switch between the instruments, adding Patrick Kabré from Burkina Faso, who adds the final dose of feeling to the beats with his voice.